303 people in our community are currently praying with you. Flowing by the throne of God? That flows by the throne of God. All the happy golden day. And provide a robe and crown. Lift their songs of saving grace. With the melody of peace. O God, who hast ordained that whatever is to be desired should be sought by labour, and who by they blessing bringest honest labour to good effect, look with mercy upon my studies and endeavours. Grant me, O Lord, to design only what is lawful and right; and afford me calmness of mind and steadiness of purpose, that I may so do thy will in this short life, as to obtain happiness in the world to come, for the sake of Jesus Christ, our Lord. Heavenly Father, every life has its trials, and I have my share. Help me to see the challenges of life as opportunities to test my sincere and single-minded faith and to grow, and endure, and persist despite obstacles in my path. For people who have it easy in life develop no strength. As you have told us, the flower of wealth and fame is short-lived, for the sun rises with its scorching heat and withers it, and its petals fall, and its beauty is gone. Give me confidence and strength in my faith, Lord, for the reward you give to your faithful is true joy and will never fade, but will remain when all flesh has been corrupted and all the things of earth have faded. Let me hold strong and steadfast through every trial and every temptation. All praise and glory to you, mighty God: Father, Son, and Holy Spirit. Make your home with me today and every day of my life; be with me in all I do. 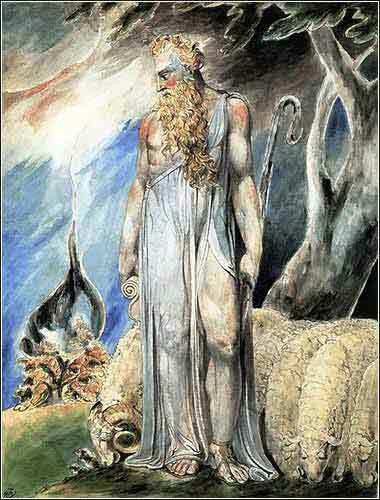 Moses and the Burning Bush by William Blake, ca. 1795. Is a brother to him who is a great destroyer. The Lord said to Aaron, “Go into the wilderness to meet Moses.” So he went and met him at the mountain of God and kissed him. And Moses told Aaron all the words of the Lord with which he had sent him to speak, and all the signs that he had commanded him to do. Then Moses and Aaron went and gathered together all the elders of the people of Israel. Aaron spoke all the words that the Lord had spoken to Moses and did the signs in the sight of the people. In this world, things constantly become less organized if left to themselves. There is actually a law in physics that says this (in a very complicated way) called the "Second Law of Thermodynamics". If you build anything, it will begin to disintegrate the second it is built. If you build a house, you either have to repair it as time goes by, or it will become more and more decrepit until it eventually falls down. The law applies (unfortunately!) to our own bodies, as it does to all animals. We begin to die the minute we are born, because our cellular structure begins to gradually become disorganized. And more to the point, the principle applies to our relationship with God. Unlike our house, we don't call the fixing up of our relationship with God "repair" — we use the term "renewal" or, in the case of widespread societal religion, "revival". But the principle is the same. Because we are part of this world, either we renew and revive our spiritual life, or else it will gradually become more and more corrupt and, eventually, fall into ruin. In today's Scripture, we see the first great example of deterioration of faith in God over time, followed by a great revival. We don't know exactly how long the Hebrews were enslaved in Egypt; 300 years is a reasonable estimate. But we do know that the two simple rules of God's covenant with Abraham — worshipping the Lord and circumcising male infants — had fallen into disregard among the Hebrews by the time of Moses. The first chapters of Exodus do not address the Hebrews' idolatry directly, but we know of it indirectly. Both Joshua and Ezekiel condemn the widespread idolatry of the Hebrews in Egypt. (Joshua 24:14; Ezekiel 20:7) As we saw in yesterday's Scripture, Moses himself failed to circumcise his son! And before we even finish Exodus, we will see the Hebrews build the famous golden calf. But for now, we see a huge renewal of faith, sparked by God Himself through his reluctant agent, Moses. Aaron is moved by the Lord to find Moses in the wilderness, where Moses tells him all that has happened. Then they go together to gather up all of the tribal elders, and Moses demonstrates for them the three signs given to him. Their belief in God is rekindled. It is the first great revival meeting. Psalm 16:8 (NKJV): I have set the Lord always before me; Because He is at my right hand I shall not be moved.